Located in the Atlantic Ocean off the east coast of the United States, Bermuda is an especially popular destination in the summer months when temperatures hover at 80 degrees. Crowds flock to this tourist-friendly, sub-tropical island for pink sand beaches and famous golf courses, while taking in its charms at the Hamilton, St. George's and King's Wharf ports. Many cruises dock for three days, which gives you even more time to explore or simply relax. The sparkling turquoise waters and pink sand beaches of Bermuda might rival those found in the Caribbean, but these British isles offer a more temperate, subtropical climate. Cruisers unfamiliar with the archipelago -- located 650 miles off the coast of North Carolina -- might be surprised to discover that the cruise season runs only from April to November -- likely because winter temperatures drop to the mid-50s from their summer highs of mid-80s. Bermuda does not have a rainy season, but it is located in the hurricane belt. Bermuda cruises can be as short as four or five nights. 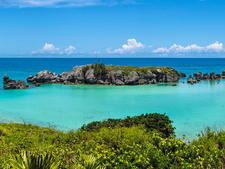 Longer itineraries that call on Bermuda may include parts of Canada, the Caribbean or even Europe. Which month you choose to cruise will depend on the length and type of itinerary you prefer and the activities that appeal to you most. 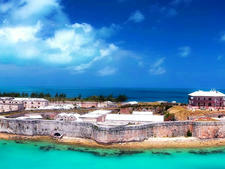 Looking for the best month to cruise Bermuda? We've outlined the cruise season so you can make the comparison. The prices quoted are per person, double occupancy and cruise-only fares. Much like the cruise industry, Bermuda has long been known as a vacation destination for the "newly wed and nearly dead." But of late, the islands have been attracting a younger, more active traveler than ever before. With some shorter itineraries out of drive-to homeports including Baltimore, Cape Liberty/Bayonne and Boston, it's become a more viable option for a wider demographic, because the often prohibitive cost of airfare can be factored out of the equation for northeasterners. Add to that the fact the British island chain has become a bit less stringent with its oft-fussy mindset and relaxed some of its infamous restrictions having to do with the number and size of ships in port, and you might just find yourself booked on a Bermuda cruise and hunting for the best in-port diversions sooner than you thought. 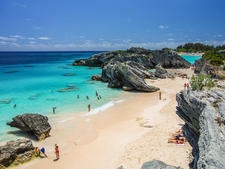 Bermuda has undergone a revolution in ship-sponsored excursion offerings -- the best of which highlight the archipelago's fabulous pink sand beaches, unmatched surplus of golf courses, stunning natural history and distinctive culture. Whether you have the luxury of three days or just one, check out our favorite outings for your next Bermuda cruise. If you're looking for a no-fuss vacation, with plenty of opportunities for R&R, the British colony of Bermuda could be just the answer. The tiny country has an amazingly high repeat visitor rate, and we say it must be a tribute to the simple pleasures this group of islands has to offer: blue skies meeting blue waters, and pink sand beaches lying along winding roads sprinkled with cottages washed in lemon yellows, baby blues and pistachio greens. Not to mention Bermuda's sophisticated museums; high-end shops, plentiful golf courses, historic sites and multitude of dining options. The eight largest islands, connected by causeways and bridges, measure just 22 miles in length and barely two miles across at the widest point -- so you can travel from one end to the other in about an hour and from north to south in less than 15 minutes. 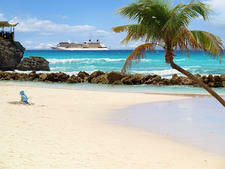 In the past, Bermuda had set rather rigid guidelines for cruises, including a stipulation that ships had to remain there for three consecutive days per sailing and a rule that prohibited larger ships from calling. But in more recent years, Bermuda has opened itself up to more mid-size and large ships and has added some variety to the types of cruise itineraries that are permitted (though only a handful of sailings feature ports outside of Bermuda). With more choice, Bermuda cruise options make this traditionally more costly vacation destination a little easier on the wallet -- though don't expect any bargains once you disembark the ship. King's Wharf -- a former berthing point for the British navy -- is the primary port for mega-liners and has grown in popularity to not only rival that of longtime stops Hamilton and St. George's, but to surpass it. 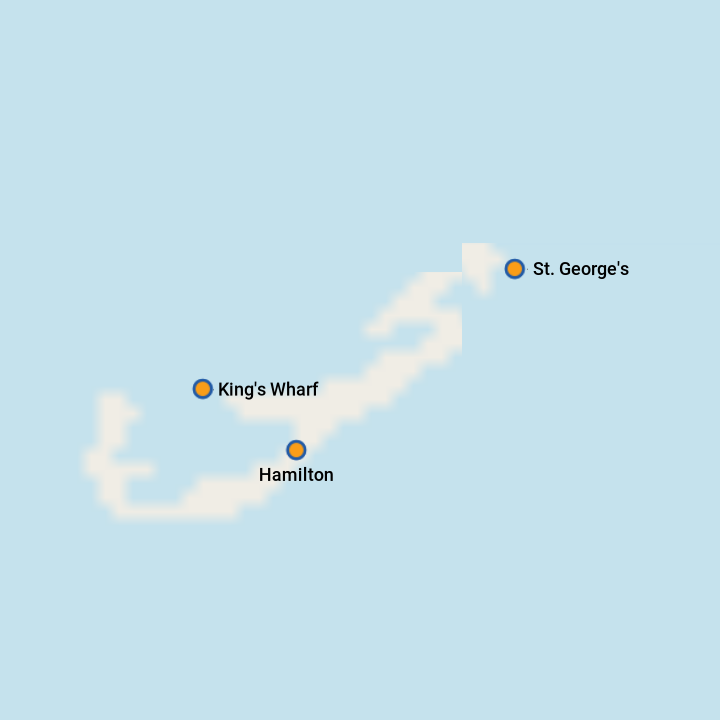 However, keep in mind that it's a breeze to reach both Hamilton and St. George's from King's Wharf. 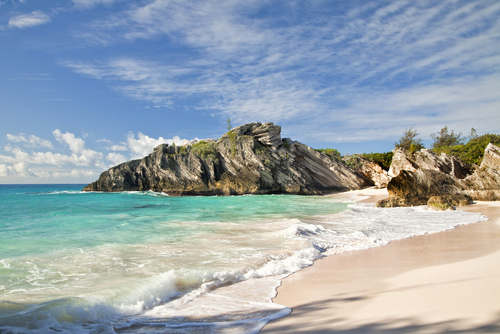 Get the most out of your Bermuda vacation by hitting these beaches.